We have tried several Spanish programs over the years. I have looked at most of them available, I think. I’m not sure why, but foreign language seems to be a very hard product for me to find and LOVE. So, I was excited to try See It and Say It from Flip Flop Spanish. The very first thing I noticed about this product was the package as I opened it up…it is SUPER user-friendly! That is always a HUGE bonus for me as a mom. I tend to shy away from programs where I have to do hours of reading and planning before starting it. Honestly, those programs get shelved at my house. I just don’t have enough time in my days to spend hours preparing for something and then hours implementing it. 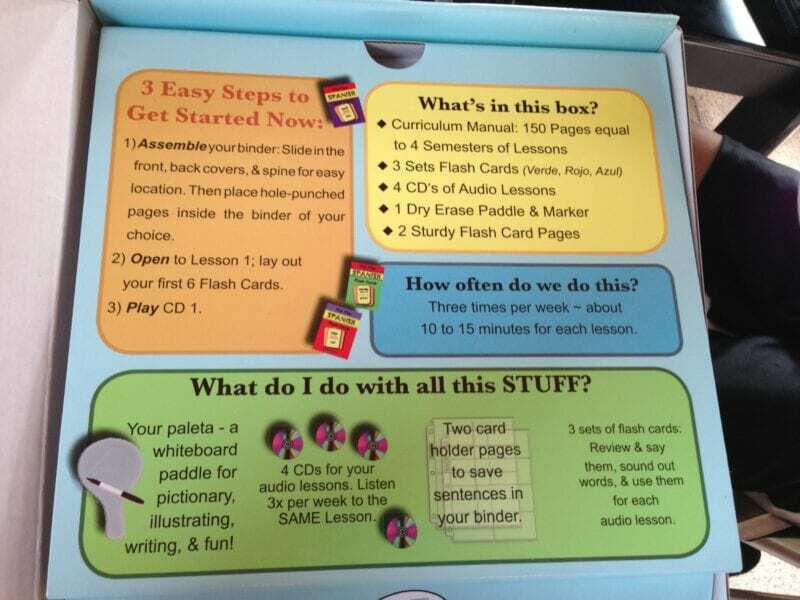 As you open the box from Flip Flop Learning, there are directions right there – inside the open box from the company – telling you what to do first!! Love it! After opening your package and reading the directions for how to use your materials, the “user-friendly” manner continues! The teacher manual is very simple and easy to read – another must-have for me in my homeschool! The only amount of “planning” (if you will call it that) that you do with this program is to set up your flashcards in a certain order for each lesson. I found myself flipping through lots of cards to find the right ones – but again, this took me a few minutes at the start of each lesson. So, I can handle a few minutes!! 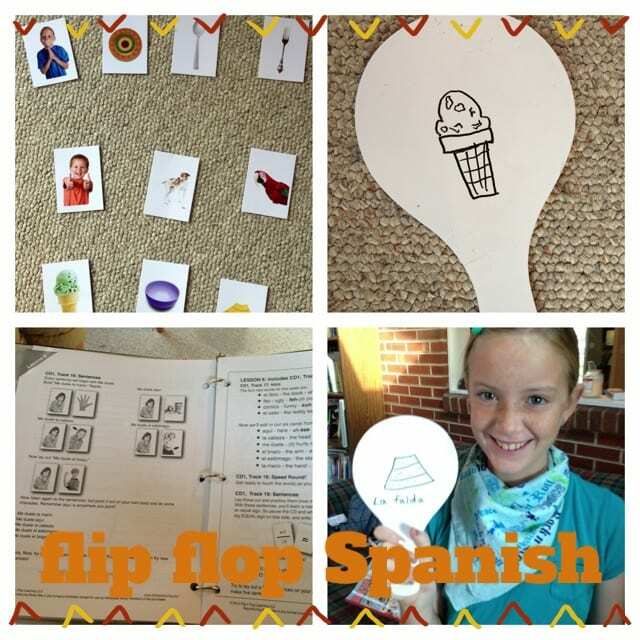 My kids and I enjoyed the flashcards and the games that Senora Gose put together in this curriculum! Of course, the games were their favorite portions. I think my favorite part is the flashcards…I really like them! We started each lesson by listening to the audio CD that goes along with this program. Senora Gose has the teacher set out the flashcards that each lesson introduces. I usually set out the flashcards on the floor and had my kids sit around the picture cards. Listening to the audio CD, Senora would have the students point to the cards as she said the words in Spanish. This is perfect for audio learners, visual learners and kinesthetic learners as well! I love how she incorporates various learning styles into her lessons. The audio lessons on the CDs are very short. So, my kids never have time to be bored during Spanish. They go through old words for review and introduce a few new ones for each lesson. She also incorporates short little games onto the audio CDs. She will name words pretty quickly and see if the kids can touch all the correct cards. My kids enjoyed this one. 🙂 And it’s great practice in just a short minute or two! I’m glad I was able to review this program. I’ve often had people ask me about Spanish curriculum and I have told them about the various programs I’ve tried but never had one I could wholeheartedly recommend! 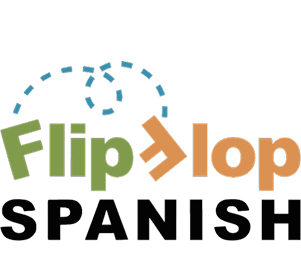 Well, I believe that has now changed with the introduction to Flip Flop’s Spanish program See It & Say It! I think it’s great! See It & Say It Spanish sells for $99.95 here. If you’d like to read what other families are saying about Flip Flop Spanish, please head over to the TOS crew blog!